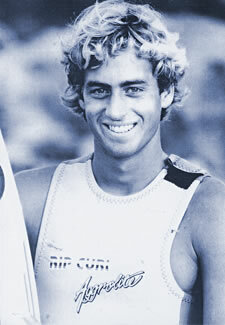 Tom Curren "1995 Surf Champion"
Three-time World Champion (1985, 1986, 1990), Tom Curren was the first American to win the men's title. At only 31 years old, he holds the record for the most World Champion career victories -- 33 from 1982 to 1992 -- and the highest earning in a single season ($132,800 in 1990). 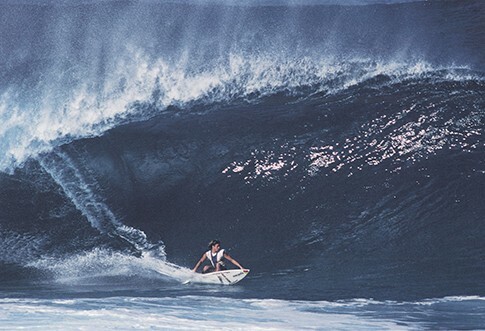 Curren is also a three-time Op Pro Champion, winning in 1983, '84 and '88. Besides spending time with his three children. Curren is a music enthusiast and plays guitar. He's also active in Ocean-Aid and the Surfrider Foundation. He encourages young surfers saying, "There's a lot of talent and ability waiting to be challenged. It takes years of focus and patience to develop the ability and energy to be a champion. But even if you don't make it to the top, there's plenty of room in the industry to earn a living pursuing the surfing lifestyle." he went on to explain, "I never forget first the gift of the wave. It's a miracle just being able to ride it, even if the wave isn't great!"